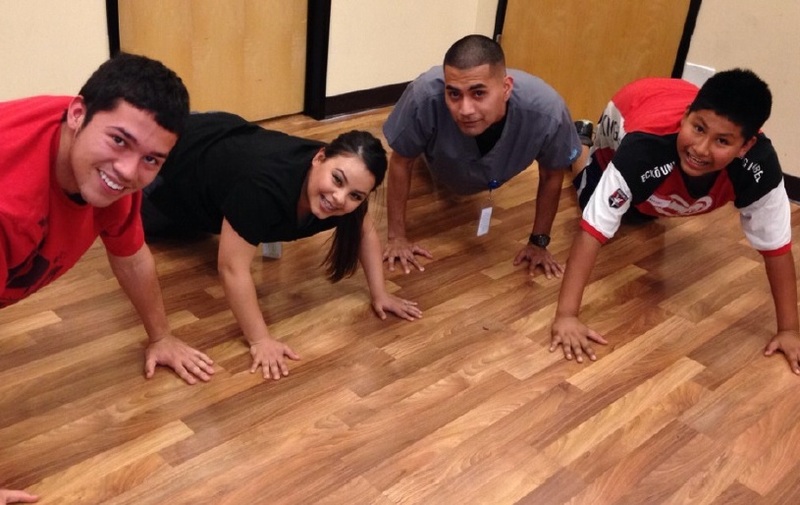 Participants in Campeones de Salud exercise with staff who help support their health goals. Photo courtesy of Santa Rosa Community Health Centers. During a routine physical exam last year, Carlos, 14 years old at the time, learned that he had high blood pressure and was pre-diabetic. After receiving this diagnosis, Carlos was referred to the Campeones de Salud (Champions of Health) program at the Southwest Community Health Center – one of nine sites run by Santa Rosa Community Health Centers (SRCHC), a Federally Qualified Health Center (FQHC) and Direct Relief partner in Sonoma County, Calif. that provides health care to low-income and uninsured people in their community. Ever since his mother Maria lost her health insurance when pain an her arm made it impossible for her to work, she and Carlos had been going to Southwest Community Health Center for care, where no one is turned away because they can’t pay. Campeones de la Salud combines behavioral health best practices with research-based clinical management and peer support to help children and their families develop healthy lifestyle habits. It is a series of 10-week sessions serving a group of about 30 youth and adolescents with a Body Mass Index (BMI) at or near obesity. Each two-hour session is conducted entirely in Spanish and includes activities for the participant’s entire family. The Campeones program was based on other successful family-based approaches, but is unique in that it specifically targets low-income Latino families in a culturally appropriate way. This approach is one of the reasons why SRCHC was selected as one of seven winners of the 2014 “Innovations in Care” Award as part of the BD Helping Build Healthy Communities initiative, implemented together with Direct Relief and the National Association of Community Health Centers (NACHC). The awards seek to recognize innovative approaches to the prevention and treatment of diseases that disproportionately affect vulnerable populations in the U.S. Helping low-income Latino children and their families maintain a healthy BMI is SRCHC’s key strategy for preventing diabetes and diabetes-related complications in their service area. As for Carlos, improvements in his health became clear after just a few months. His blood sugar levels dropped from 5.8 to 5.1. Direct Relief is privileged to support SRCHC as they help children and their families develop healthy habits to improve their well-being.